I toyed with the idea of interactive multi-narratives a number of years ago, starting with a project called ‘FMRL – The Life of a Fly’… It didn’t really go anywhere and this is the remnants of where I got. I also worked on a number of interactive installations which allowed dancers to create real-time stories using the positions of their bodies within a space adorned with sensors that tracked specific movements… these have long disappeared in the dust of time. But interactive multi-narrative experiences are still something that interests me. I feel a bit torn in my own feelings towards the narrative paradox, which states the more interactive a story is, the less effective the narrative journey becomes. There’s some interesting reading out there on the subject and some good points to be made either side of the discussion. I have experienced some examples of interactive narrative that works and also multi-narrative, but it’s hard to set these experiences against something like film when it comes to narrative journey, and the narrative experiences that are most effective usually have limited levels of interactivity. I think it seems possible to create a truly engaging story within both of these areas and maybe this already exists but haven’t come across it yet? Maybe it hasn’t really been possible in existing mediums or there hasn’t been the right kind of funding available? Never-the-less, I’m really drawn to making Vestige an interactive, multi-narrative experience to some degree, even if it just dips its toes. The subject matter of memories lends itself well to multi-narrative storytelling and really this is the main reasoning for me wanting to explore it. When recalling memories we tend to reshape the events differently each time. Memories often drift into others, sometimes seamlessly, sometimes abruptly. Sometimes the context in which we recall memories can define the path the memories take. When we tell stories from our past we usually refine the story on each telling, often embellishing over time to even if it’s just to keep it interesting for ourselves to tell. This is the same kind of process that we apply to writing stories; we rewrite and refine until the story is worthy of being told. But when a story isn’t committed to paper it remains malleable and it can be changed to better suit the audience we tell it to. The story of meeting my wife changes subtly every time I tell it but my friends hear a very different version compared to my family. As my research delves deeper into the science of memories I’ve started to draw interesting parallels between story structure and the biological structures within the brain. I’m completely inspired by the work of Santiago Ramón y Cajal, a Spanish neuroscientist who pioneered investigations of the microscopic structure of the brain. I’m kind of convinced there is some connection between the structures in our brain and how we navigate our thoughts. I believe that the act of sketching something can help you understand it differently. If you want to know what someone looks like, look at a picture of them, but if you want to know how someone looks, draw a picture of them. 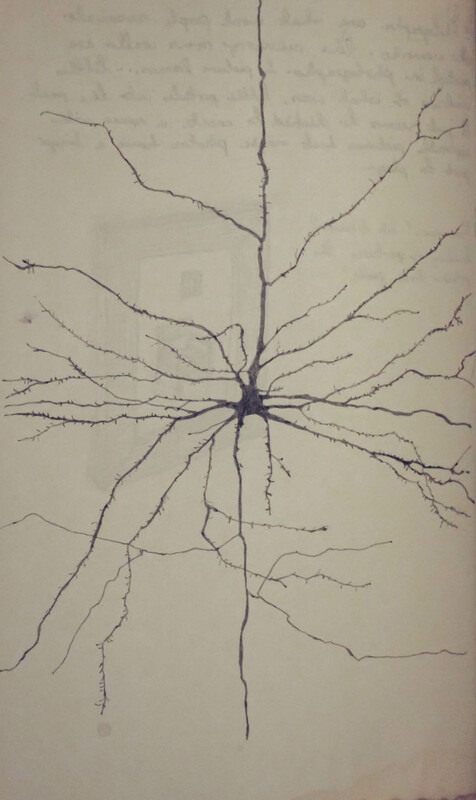 … So I’ve been drawing neurons. I’ve been thinking about how thoughts are really just impulses travelling through complex branching structures and how pathways could be traced through the neurons of the brain to reveal stories. Stories that have a specific starting point and cross a vast network of potential avenues to reach their conclusion. How would that story look if a different path was picked? And how does this relate to building a narrative structure? Is there something useful in this route of research that will help define a method for designing multiple narratives? There are lots of other structures that can be seen in the world that relate to interactive multi-narrative, but starting with the brain seems like the right place for a story about memories.